Senator Black represents the 13th Senate District in Virginia. He sent the following prepared remarks to the conference, under the title “Syria, a Case Study of How the U.S. Has Engaged in a Policy of Regime Change in Violation of the U.S. Constitution and International Law.” Black was wounded during fierce fighting with the 1st Marine Regiment in Vietnam, where he also flew 269 combat missions as a helicopter pilot, and crash landed after his helicopter was damaged by enemy machine-gun fire. Over the past several years, I have become deeply concerned about the destructive course of our foreign policy in the Middle East and Northern Africa. We have aligned ourselves with the Muslim Brotherhood and al-Qaeda jihadists against governments that afforded their population the opportunity to practice their respective religions and to live in peace with their fellow citizens. I have taken a number of initiatives to address this problem: On July 12, 2013 I wrote to Speaker John Boehner and members of the House, urging them to prohibit expenditure of funds to support the revolution in Syria; in October 2013 I publicly urged Egyptian General al-Sisi to run for the office of the Presidency of Egypt to restore stability to that nation; on April 1, 2014 I wrote Syrian President al-Assad, thanking the Syrian Arab Army for its rescue of Christians and Alawite Muslims imprisoned along the Qalamoun Mountain Range; on June 10, 2014 I wrote Syrian President al-Assad congratulating him on his reelection; and on May 18, 2014 I wrote President Barack Obama urging him to block the release of MANPADS anti-aircraft missiles to Syrian insurgents. The evidence is overwhelming that the so-called Arab Spring was deliberately designed to violate the national sovereignty of several stable, secular Arab countries, none of which had been involved in 9-11. Arab Spring was intended to achieve regime change, turning those countries over to the Muslim Brotherhood and al-Qaeda affiliates. Evidence suggests that the overthrow of Qaddafi in Libya was conceived and executed as part of a larger scheme devised to overthrow President Assad of Syria, without regard to the U.S. Constitution or international law. President Obama meets with then-Ambassador to Syria Richard Ford, Aug. 1, 2011. Ford was well qualified to carry out the Obama Administration’s policy of working with radical Islamists against the al-Assad government. I will focus on the case of Syria and the role of Ambassador Robert S. Ford to show how the overthrow of Qaddafi was conceived as an integral component of the attempt to overthrow Assad. Robert S. Ford was nominated by Obama to be U.S. Ambassador to Syria in late 2010. A dozen Republican Senators opposed his nomination, because the U.S. had not had an Ambassador in Syria since 2005. The Obama Administration bypassed Congress, and Ford was given a recess appointment, making him the Syrian Ambassador. Ford arrived in Damascus in January 2011, just one month before the first demonstrations against Qaddafi began, on Feb. 17, 2011, in Benghazi, Libya. The first demonstrations in Syria occurred shortly afterward, on March 18, 2011, in the city of Hama, Syria. Plans to overthrow President Assad had been under development since 2005. On April 17, 2011, one month after the first demonstration in Syria, WikiLeaks released secret diplomatic cables revealing that the U.S. State Department had been funding opponents of Syrian President Bashar Assad beginning under the Bush Administration in 2005 and continuing under Obama. The files showed that the U.S. gave $6.3 million to the Movement for Justice and Development—a London-based Muslim Brotherhood organization—to operate the Barada TV satellite channel broadcasting anti-government propaganda into Syria. The Movement for Justice and Development, which openly advocated Assad’s removal from office, was banned in Syria. Another $6 million went to other initiatives, including the Middle East Partnership Initiative and the Civil Society Strengthening Initiative. Ford was uniquely qualified to carry out the Obama Administration policy of working with the Muslim Brotherhood and al-Qaeda against the government of Syria based on his prior experience in Iraq where he reportedly helped form Kurdish and Shi’ite death squads. From 2004 to 2006, Ford served in Iraq. In January 2004 he was the U.S. representative to the U.S. occupied Shi’ite city of Najaf in Iraq. A few months later he was appointed as the “number two man” (Minister Counsellor for Political Affairs) at the U.S. embassy in Baghdad under John Negroponte. The person Negroponte assigned to a new counterinsurgency unit in Iraq, the Special Police Commandos, under the Iraqi interior Ministry was Ret. Colonel James Steel, who had previously been employed as an advisor to crush an insurgency in El Salvador. After this two-year stint in Iraq, Ford was appointed Ambassador to Algeria in 2006 and then in 2008 returned to Baghdad as Deputy Chief of Mission, at which point he undoubtedly became involved in the implementation of the Syrian destabilization project. Upon his arrival in Syria in January 2011, Ford began publicly supporting forces which the U.S. and its British and French allies had been organizing since at least 2005. Ford’s first provocative action was to visit the city of Hama, Syria, on July 8, 2011 without the permission of the Syrian government, where he promised rioters the support of the U.S government. Both he and the French Ambassador violated diplomatic protocols, slipping through Syrian security to reach the demonstrators in order to demonstrate public support for them. 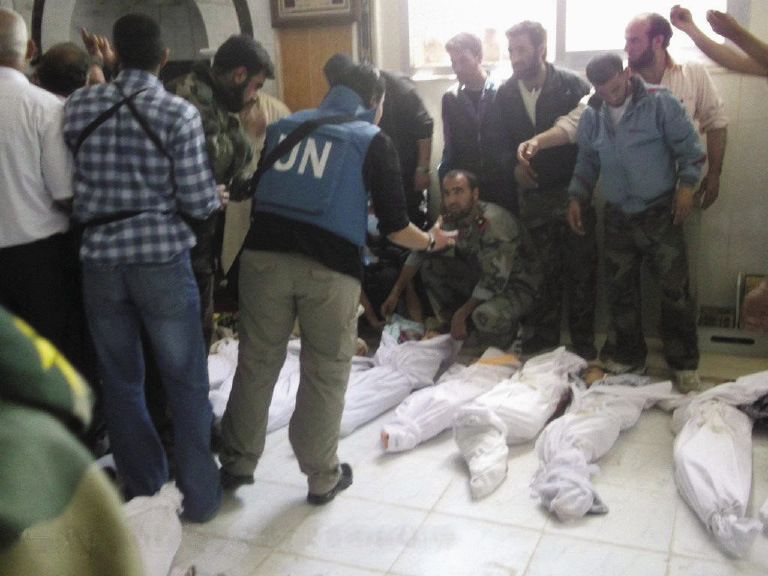 Victims of the massacre in Houla, Syria, May 25, 2012. The fratricide in Syria has been aggravated by U.S. support for al-Qaeda-linked forces. Who were the people Ambassador Ford supported and labeled “moderates”? In several Syrian cities, and especially in Hama, extremists supported by Ford marked every Christian house, then unleashed violent mobs who forced Christians to flee those homes; they carried out ethnic cleansing against Alawite Muslims. With methods reminiscent of the Nazis’ anti-Jewish pogroms on Kristallnacht, gangs rampaged through Hama, yelling: “Christians to Beirut; Alawites to the Grave.” Seventy-thousand Christians abandoned their homes and businesses, fleeing to Damascus with only the shirts on their backs. The vicious mobs were described as “moderates” in Ambassador Ford’s deceptive diplomatic communiqués., In August, Ford left Damascus once again to visit the southern village of Jassem, where he met with more opposition activists. In October, Ford met with Hassan Abdul-Azim, who heads the outlawed Arab Socialist Democratic Union Party, and was attacked with eggs and tomatoes by government supporters who now understood his motives. On Oct. 24, 2011, Ford was recalled from Syria due to what the U.S. State Department described as “credible threats” to his safety. According to American officials, Ford had been attacked by an armed pro-government mob, and Syrian state television had begun running reports blaming him for the formation of death squads similar to those in Iraq. He returned to Damascus in December 2011, but in February 2012, as the security situation in Syria sharply deteriorated, the American Embassy was closed. He later became the chief American envoy to the Syrian opposition, a position he only recently gave up in March 2014. On June 10 Ford, once again called for regime change by arming the “right” opposition, and he has called for arming the rebels with advanced man-portable anti-aircraft missiles capable of downing Syrian MIGs—or American passenger jets. The United States had normalized relations with Libya years earlier, and its government was helping the west in many ways. Nonetheless, the administration orchestrated a coordinated attack on this neutral, non-belligerent nation, ostensibly because they were too tough in dealing with an uprising in Benghazi. In fact, its purpose was to liberate Libya’s large arsenal of sophisticated weapons. In Libya, the Obama Administration worked closely with the al-Qaeda-affiliated Libyan Islamic Fighting Group (LIFG), led by Abdel Hakim Belhadj. With Washington’s approval, Qatar and the UAE supplied the LIFG with weapons, in violation of the UN arms embargo. This allowed Belhadj to emerge as the military commander of the Tripoli Military Council in August 2011, once Western air power reduced Libya to ruins. Soon after taking charge, Belhadj and the head of the Libyan Transitional National Council, Mustafa Abdul Jalil, traveled to Qatar to meet with NATO officials and financiers of the Libyan Revolution. In October 2011, Burhane Ghalioun, the Muslim Brotherhood-influenced head of the Syrian National Council, and Jalil signed an agreement in which Libya agreed to assist in the overthrow of the Syrian government of Assad. Soon thereafter, in November 2011, Belhadj traveled to Turkey and met with the Syrian Free Army. On Dec. 11, 2011, an agreement was reached at a meeting in Tripoli involving Jalil; Youssef Qaradhaoui; Rached Ghannouchi, head of the Tunisian Muslim Brotherhood party, Ennahda; Hamad Jabber bin Jassim al Thani, the Foreign and Prime Minister of Qatar; the number two of the Muslim Brotherhood in Syria; and Belhadj. The group would arm and send fighters from Libya and Tunisia into Syria. In November 2011, six hundred al-Qaeda-linked LIFG fighters led by Mahdi al-Harati, the deputy commander of the Tripoli Military Council under Belhadj, went to Syria to fight Assad. Throughout 2012, according to the UN, weapons were shipped by boat from Benghazi, Libya into Turkey, for delivery to jihadists in Syria. Weapons were also shipped by plane from Libya to Qatar and then to Turkey and Jordan for delivery to jihadists in Syria., , , , , ,  These shipments violated the UN arms embargo. To facilitate shipping captured Libyan weapons to the Syrian rebels, NATO assigned control of the Benghazi airport to Turkey during and after the overthrow of Qaddafi. While at the State Department, Ford was part of a small team which oversaw the recruitment and training of terrorist brigades to be deployed to Syria. This team included Frederic C. Hof, who served as Washington’s “Special Coordinator on Syria,” and Derek Chollet, head of the National Security Council’s Syria Task Force. This team operated under the leadership of Jeffrey Feltman, former Assistant Secretary of State of Near Eastern Affairs, who is now UN Under-Secretary-General for Political Affairs. Feltman was reportedly in contact with Saudi Foreign Minister Prince Saud al-Faisal and Qatari Foreign Minister Sheikh Hamad bin Jassim al-Thani. He was also in charge of a Doha, Qatar-based office for “special security coordination” pertaining to Syria. Prince Bandar bin Sultan of Saudi Arabia was part of this group. As demonstrated here, the Obama Administration has been involved in plotting and carrying out aggressive war in violation of the U.S. Constitution and in violation of international law. It has allied itself with and given material assistance to the Muslim Brotherhood and al-Qaeda, which have committed war crimes against Christians and other religious minorities. Yet despite a decade-long process of subversion, the Syrian people rallied powerfully for President Assad during recent elections. Syrian voters dealt a stinging rebuke to the violent jihadists, demonstrating their revulsion at beheadings, public executions, cannibalism, and crucifixions that came to characterize the rebellion. Public support for the revolution has dissipated. The New York Times reported that Assad’s landslide re-election “surprised no one,” and that “the huge margin of victory was entirely believable.” The 89% vote margin and the 73% turnout were equally stunning. The Associated Press reported strong backing, not just from Christians and Alawites, but from Sunni Muslims too. Without them, President Assad could never have won such a wide margin of victory. Sunnis staffed many of the polling places, and at one mosque, 10,000 Sunni women prayed for Assad’s reelection. It is now clear that foreign plots to divide Syrians along sectarian lines have failed, and the people remain united. This week, ISIL, Global Jihadists controlling much of Syria and Iraq, have beheaded 1,700 innocent people in Mosul, Iraq. Their armed columns are driving toward Iraq’s capital, Baghdad. I have warned of arming and training jihadists, and now the chickens have come home to roost. By undermining stable Arab states, and by arming and financing al-Qaeda-linked jihadists, we have unleashed an unprecedented wave of savagery that threatens to consume the civilized world. We must find a new direction, and do so quickly.
. http://www.nytimes.com/2013/03/25/world/middleeast/arms-airlift-to-syrian-rebels-expands-with-cia-aid.html?pagewanted=all New York Times, March 24, 2013 "Arms Airlift to Syria Rebels Expands, with Aid from CIA"
. Today's Zaman, March 29, 2011, "Turkey Will Run Benghazi Airport," http://www.sundayszaman.com/newsDetail.action;jsessionid=OLRsBj1mF+EvaGkBUAWoMQHy?